Pretty plastic timer is mesmerizing to watch. Great relaxation tool for stressful moments. Slim size of 2.25" x 5.75" will sit nicely on a desk or counter top. The drops go rolling on and on! Turn the timer over and watch the colorful liquid drop down and roll one drop at a time. 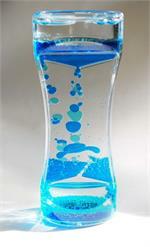 Great for all ages, these can be used for stress/relaxation, quiet time or a refocusing prop. 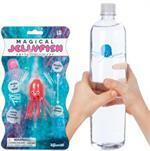 Drop this 2" jellyfish in a plastic water bottle and squeeze to make him dance. 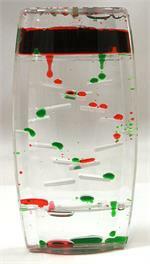 Also called a Cartesian diver, this is a fun way to explore the relationship between pressure and buoyancy.